It’s Friday – and in my world, that means breakfast tacos. 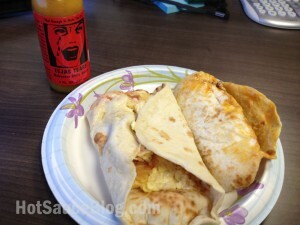 I usually stop and grab anywhere from 20-30 breakfast tacos for the office to enjoy and this Friday was no different. I also make sure to try & stop at different taco places each time in order to try a variety of tacos and spread the taco love. 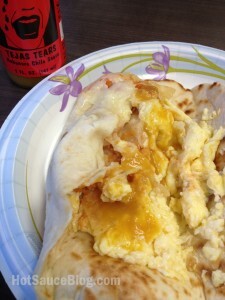 Plus, I get breakfast tacos (ulterior motive much?). And I decided to test out the Chroizo & Chilaquiles tacos – so I opened up the bottle of Tejas Tears hot sauce. BTW – I’m not sure where I got this bottle from. It’s one that was sitting in the cupboard for a while, but I’m pretty sure I bought it from Central Market here in Houston. 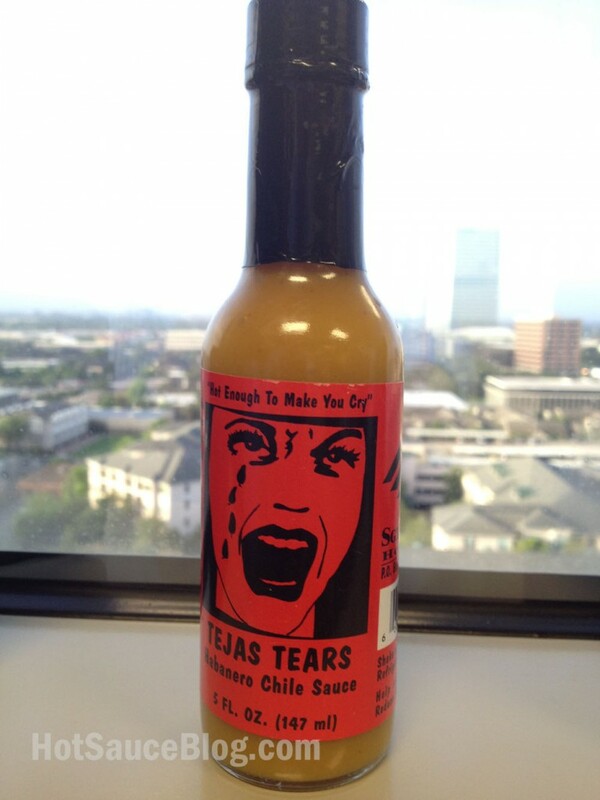 As you can see – the Tejas Tears hot sauce is very thin – it poured out like water onto the taco. It smells exactly like habaneros & vinegar – a bright fruity scent followed by a smack to your olfactory senses from the vinegar. 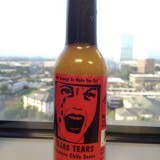 I poured it generously onto the Chilaquiles taco and dug in. For those of you that don’t know what Chilaquiles is – it’s a dish made of fried tortillas, cheese and salsa – in most cases eaten for breakfast or brunch. Much like the punch that this sauce delivers to your nose – it will smack your taste buds awake with a sharp hit of habanero and vinegar. It’s not overpowering – almost wasabi like – with the quick hit that wakes you up and makes you pay attention. But the heat fades pretty quickly, so I would classify this as a mild hot sauce – because the heat doesn’t linger around and make you regret what you just ate. Overall, it’s a good sauce – I would recommend using it in soups for that thin consistency and heat level – you won’t be left with a bowl of regret. But I think I’ll be trying a different hot sauce on my tacos next week – this wasn’t bad, but not memorable enough for me to keep using on my beloved breakfast tacos.